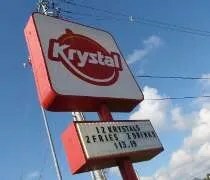 For someone who likes to think I know a lot about food and restaurants, I felt a little ignorant the first time I saw a sign for Krystal. J and I were driving through Sevierville, TN on the way to our cabin. I knew it looked like fast food, but I had never heard of it. J said she thought it was like a White Castle. That was a turn off to me, but we also thought it would be fun to try something new. As we were leaving Pigeon Forge on Wednesday morning, J suggested stopping. It was early and I was hungry. We had a three hour drive to Nashville where we already had lunch plans, so getting a little something to eat wasn’t a bad idea. The Krystal in Pigeon Forge is right on the Parkway. We pulled in probably a little after 9:00 and the place was empty. In fact, we were wondering if it was even open. There were maybe two cars in the lot, but it looked dark inside. We pulled in and saw people moving. I tried the door and it opened so we went in. Find all my restaurant reviews here!